The fear of missing out (a.k.a FOMO) can have a powerful impact on shoppers. 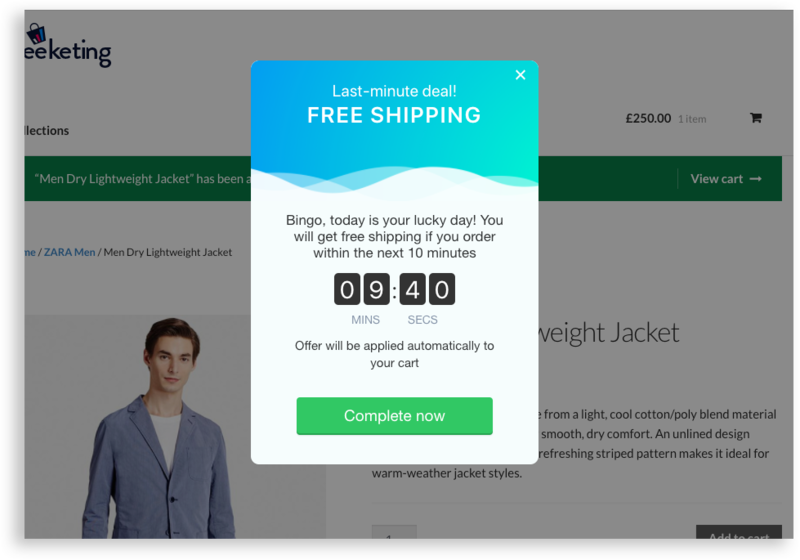 A split test done by ConversionXL showed that when a countdown timer was placed on their product page, it converted 10% better than a variation of the page without a countdown timer. Creating a sense of urgency among your shoppers can help make more people buy and less people “go home and think about it”. Now there are dozens of ways to create a sense of urgency, such as setting a deadline, offering something in limited quantities, etc. And the simplest way you can do this right now is using a WooCommerce countdown timer. Sell limited edition / special products. Best use with a low-stock countdown widget. 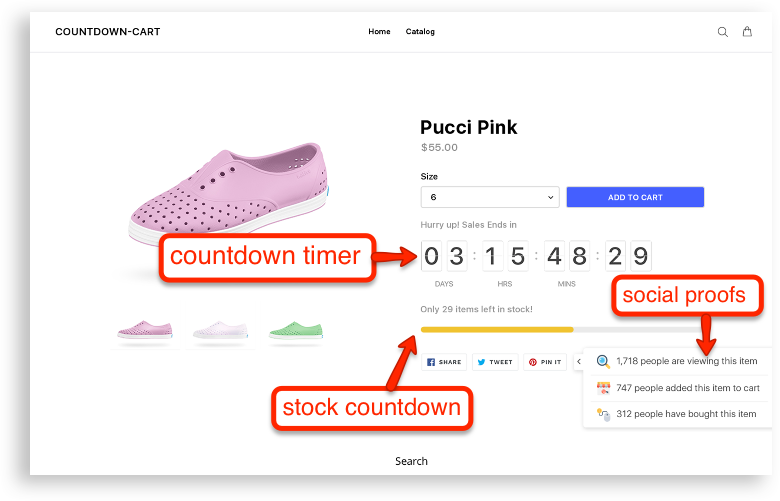 In this post, we’ll show you top 5 best WooCommerce countdown timer plugins you should use for your store and how to implement this feature on your site wisely. You may not know: 99% of WooCommerce stores are leaking money…The chances are you’re one of them. Open up this page to see how your store is losing money and learn how you can fix it within 24 hours. Before we started, we’d like to state that we didn’t just throw up the first 5 plugins that showed up in the WP search query. Instead, we only recommend plugins that we have tried out and used for a long time ourselves to make sure they work well for your WooCommerce store. Allbarks is using Beeketing’s offers to recover 19% of abandoned carts every month. Herbapproach made $115,000 extra sales in 2 months just by using Beeketing’s countdown offers. The results speak for themselves, but that’s not all that makes Checkout Boost top our list. Not a normal countdown timer plugins – Checkout Boost – built in the Beeketing for WooCommerce plugin – provides a unique feature that you can’t find an alternative on the WP Directory: the countdown offer in form of a pop up. You can use it to easily create a sense of urgency, increase conversion rate, and make more sales. 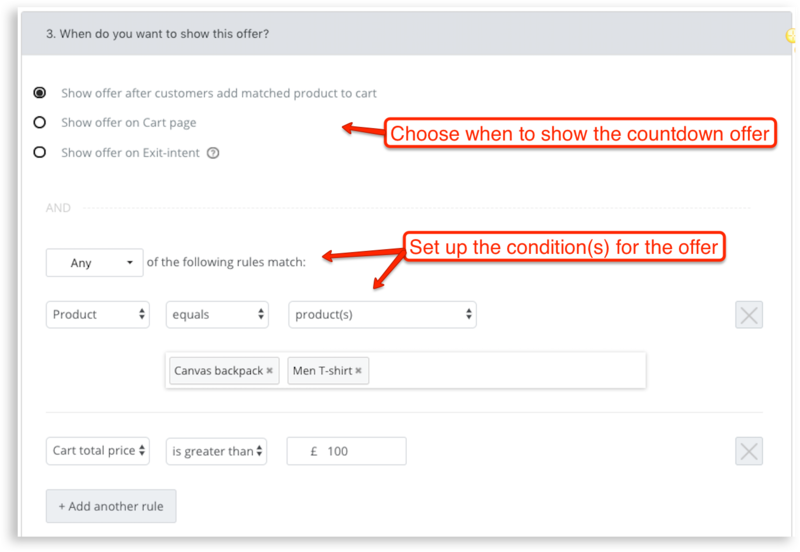 You can target each offer to a specific product, collection, or trigger it to show only when some criteria are met. And it also includes 11 beautiful built-in themes for your urgency timers, as well as a variety of different ways to display timers. Price: The Checkout Boost app built-in Beeketing plugin provides 15-day free trial for new installs, after that the app costs $20+ per month. 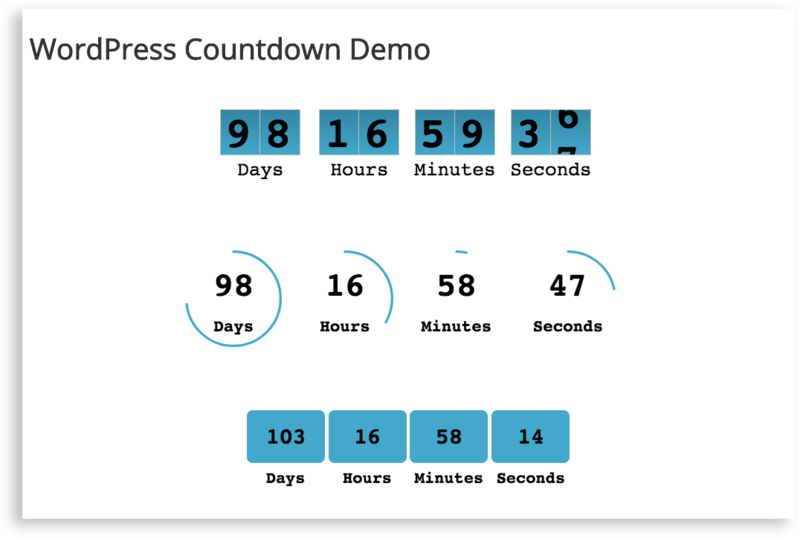 T(-) Countdown is a free plugin that helps display a styled countdown timer on your WooCommerce store using its widget and/or shortcode. 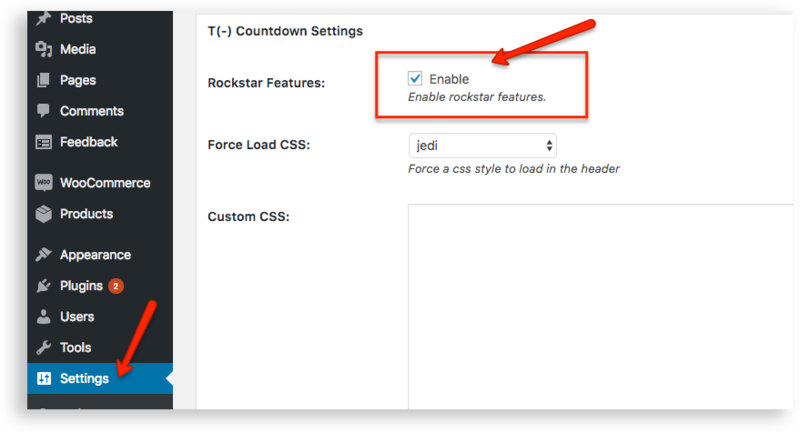 To display a countdown clock in any widgetized area – such as sidebar or header, footer – you can use the plugin’s built-in widget by ticking this option to Enable Rockstar Features then customizing it in the WP Admin. If you want to display a countdown timer in a specific post or page, you’ll need to create your own shortcode. Here’s the Detailed Documentation – where the developer included many examples of all the shortcode attributes for your knowledge enhancement. 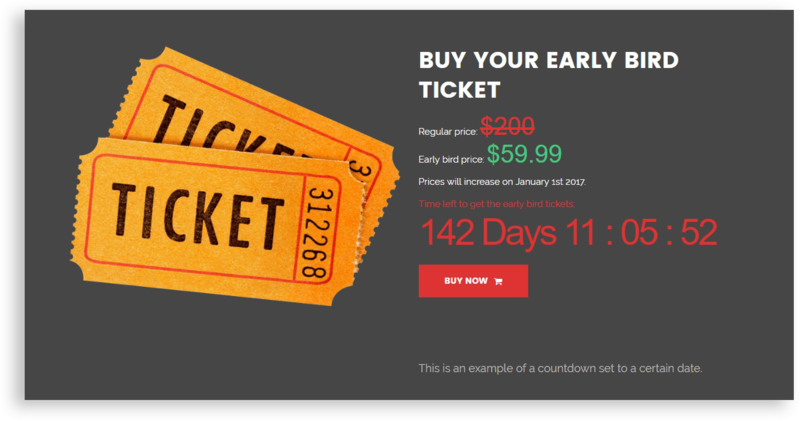 Price: T (-) Countdown plugin is free while T (-) Countdown Pro costs $49.99 for a single site license. Stock countdown: The counter bar displays with the number of items available for sale. This feature helps create scarcity, increase the perceived value of your products and make your customers buy faster. Social proof widget: The widget shows the number of visitors who have viewed your products and how many of them were sold. It creates a positive influence and build trust on your brand as well as your product. Countdown Cart is a well-coded app that offers advanced functionality to increase the checkout rate and do marketing for your products. If you’re looking for a lightweight but powerful and feature-rich countdown timer tool, Countdown Cart is a good choice that’s totally worth a try. Price: free-forever (even with customizable features). With Wow Countdown plugin, you can create both limited-time and limited-amount countdowns. The plugin sets limits on the number of units purchased and the duration of promotional offers to increase the interest for each shopper. Using cookies to track the session, Wow plugin will prevent data from being reset if a shopper refreshes your site. You can also set the due date to decide when the countdowns will start over. Price: Pro version costs $19 for a single site license. Similar to T (-) Countdown plugin, Countdown Timer by WPDevArt will help to add a functional countdown timer to a widget or to any post / page on your site in just a few minutes. This plugin is very easy to use so that you can quickly implement a timer on your site without a hitch. If you’re running many campaigns or promotions together at the same time, feel free to add any number of countdown timers you want, the plugin wouldn’t limit anything. There’s a good chance that you’ll need to custom CSS codes to redesign the basic template and make it match your store’s look and feel. Price: WordPress Countdown Timer Pro costs $13 for a single site license. We’re all about helping you increase your sales & conversions so you can start earning more money with your WooCommerce store. But please take note: don’t ever overuse those timers. You might overwhelm a shopper and make them feel like they’re forced to take action. The result is you’ll end up scaring them away instead. That’s it! Now you know the best WooCommerce Countdown Timer plugins to create a sense of urgency and scarcity on your site. Are you currently using any of those plugins we listed above? Prefer an alternative? Let us know your thoughts in the comments section below! And don’t forget to subscribe Beeketing Blog for more helpful WooCommerce guides, tutorials and resource lists.